For I go up to the sky. While night walking in snaking snow under a blue blanket of stars, I have to stop and gaze at the stars no matter how bitter cold it is. I can’t help it. Even as a little girl in the deep freeze of Minnesota winters, the stars whispered, “Made you look.” Back then, stargazers were relatively unimpeded by light pollution, and it was easy to get lost in the bling of stars and the glow of planets. I was told by my Métis grandfather that it was unbecoming to stare at the Milky Way, the Thunderbird’s Path, because the Thunder beings were not to be disrespected by gawking. So even though I am now about science and, yes, science fiction, and say to myself, sometimes the Milky Way is just stars, I do still clasp the talismanic meteorite medallion I wear as a sort of magical protection. But it is hard to look away from a flight of stars gliding silently overhead like a flock of snowy owls. There is a fishing pole there, commonly known as Orion’s belt, and I always am hooked by it, and following the line to the red fish Aldebaran in the V flock of snow geese known as Taurus’s head and from there my eyes leap to a cluster of seven blue crystal stars hanging on the long neck of the night. Cree scientist Wilfred Buck calls them the Mattotasin Assinuk, the sweat lodge stars, who represent seven uncles who became seven stones and warm the lodge. From this lodge tumbles out a multitude of emergence tales like a sky basket of crystal balls, landing in primitive dwellings, reflecting prismatically on cave walls and bringing the communal knowledge of the cosmos. The Pleiades are about 450 light years from our solar system, a middle-aged constellation of hot blue extra luminous stars and an open constellation. It contains seven prominent stars with six readily seen by the naked eye. But historically it has commanded attention from indigenous people all over the planet. They lift up their faces and point with their lips and say, almost in unison, “There, that’s where our people come from. And it is to the Pleiades we will someday return.” It is so well-used, and so oft repeated in oral tradition, that perhaps all multicultural dialogs could begin well by silently pointing to the Pleiades. In fact, if anecdotal evidence from these tales was accepted as science fact and not science fiction, it would be a well-known given that we are descended from aliens who came, originally, from the Pleiades. Astronomical anthropologists say the Pleiades were a constellation of wonder only because of their heliacal nature, showing up in fall and blazing away until spring, and that its importance was mainly as a seasonal marker. The Pleiades then were the marker of planting and harvesting. But after reading hundreds and hundreds of creation tales, tales of star people, and looking at cosmic maps on everything from parietal arches to shamans’ drums, evidence points to the fact that it was much more than that. The Pleiades speak to common ancestry, from some hole in that cluster of stars way off the edge of Taurus. The Pleiades are described as a lodge, a basket, a sieve, and in many cases a womb. In fact, roughly put, even a sweat lodge is a representation of the womb of Mother Earth. In cultures that revere sky goddesses, the Pleiades are said to be the womb with seven daughters. The Altai of North Asia tell stories of Ome Niang Niang as the womb goddess, and images of her depict her with seven daughters, representing the Pleiades. There are numerous tales of this emergence from the Pleiades, from the Dreamtime tales of Australian Aboriginals to the Daughters of the Night of the Tuareg Berbers, from the Mushin of Buryats of Mongolia to the Kachina sky people of the Zuni and Quichua Mayans. There is a pattern often told: Pleiade people emerge from some hole in the cosmos, then are let down by a silver cord, and they either are or are part of a group of Star people instrumental in creating human beings. All these cultures call them “The ancestors.” They also add, “from the stars we came and to the stars we will return.” Sometimes that is taken to mean crossing the River in the Sky World (Milky Way) into the next life, and sometimes it seems to indicate a journey through that portal while still living. When Albert Einstein and Nathan Rosen theorized in 1935 that wormholes and bridges across the space-time continuum were possible, it soon became such a common device used in science fiction stories and movies as to almost be a cliché. The players may be from the present, the past, or the future, but the readers or viewers accept that in theoretical physics a wormhole is transversable between huge parsecs of space, or can be used for time travel, or even travel into the multitude of universes. However, I posit that examining the Pleiadean original tales from indigenous peoples points to a pre-historical understanding of the wormhole possibility long before it was defined by mathematics. You read about modern indigenous people using the word wormhole now to explain that hole in the Pleiades that ties us to the cosmic, and so astronomical archeologists posit that the wormhole ideas were borrowed from modern physics and not part of the early legend. However, before they used that word, they used the metaphor of a silver cord that connects the two ends of the hole. Perhaps it was a plasma tube of some sort, upon which people can travel both directions. In short, when they say, “we have met the aliens and they are us,” the idea was accepted long before it was popularized in modern science fiction. Star People, Sky Spirits, or Celestial Celebrities? When the ancestors of indigenous people spoke about Star People, they seemed to be referring to something in addition to the sky beings who are purely spiritual entities. Star people (aliens?) seem to be able to intermingle with humans on a biological basis, not just a soul-communing way. Other indigenous Star People stories are more specifically about rescuing people from a situation and actually bringing them up into the sky, generally to never return, or said to return at a later date. One can’t help but wonder if the portal is at times closed and will reopen again in the future. If it is theoretical movement through a space-time continuum, what may be hundreds of years or maybe even several millennia in Earth time is just a few moments from the other end of the portal. Modern physics is beginning to have an inkling of what that means for modern space travelers, and those of us who may be waiting for their return. In the story of the Pleiades in Aboriginal Australia, the sisters are from a certain Napaljarri tribe and they are trying to escape the unwanted attention of a Jukamara man who wishes to take one of them as a wife. The cross between these two skin groups is not acceptable, and the sisters are hauled up into the sky with a rope (cord) by a Star Woman who puts them into a canoe where they can paddle through the Dreamtime of the Cosmos far ahead of their pursuer, i.e. the Morning Star. These seven sisters eventually become encrusted with blue crystal and shine as the Pleiades themselves. Another tale of rescue or escape is the very well known tale of Mato Tipila, (Bear Tower) popular in Lakota and other Plains tribes’ mythology. In this story seven blue stone sisters were far from their village picking berries. An angry bear spotted them and began to chase them. Though they bolted to make it back to the tipis, the bear was overtaking them faster than they could run, and so they clambered up on a small boulder and began to pray to the spirit of that stone to save them. The stone person was an ancestor of theirs and heard their prayers, and was softened by their tears, and the stone began to rise beyond the reach of the bear. The bear clawed at the boulder, but it kept thrusting up to the sky to safety, where they became the shining blue stones of the Pleiades. Was the stone actually some form of intergalactic travel? There are several stories in which Star People come to Earth to find husbands and wives. In the Athabaskan tale of two sisters who married Star Men, there are a pair of sisters who are lying around a campfire and looking at the night sky. They see two Star People they like and wish that they could marry them. The Star Men hear their wishes, and soon enough they have joined them by the fire and propose to the two girls. The girls agree and go up to the stars to live with their Star husbands. Eventually they miss their families and slide down on a silver cord back to Earth. The Star Men come looking for them but they tell the girls that they can’t bring them back up anymore. Perhaps this is just an indicator that portals are not always and everywhere open. Star people and portals and lone stars and actual constellations, most notable of those the Pleiades, are depicted in ancient cosmic maps on rocks, walls, parietal pictographs, and on carvings. There is a lot of speculation as to which images are numinous spirit beings, which are human shamans in trances, and which are actually depicting Star People, aka aliens. I think the only way to know that for sure is to ask the people that still live there which image represents which. The longest continuous cycle of ancestral stories we know about are those of the Aboriginal Australians who have passed down their emergence legends for over 40,000 years. A very detailed image of Star People was made by the Worora people of Australia and contains Wandjina. They are called Sky People but are said to have originated from the Milky Way and helped create human beings. These Star People are said to be aliens, and indeed for the modern viewer they resemble the cryptological creature called “Greys” by a lot of science fiction enthusiasts as well as UFO-ologists. Whether these are “real” Star People or not, and thus part of our human DNA, cannot be proven nor disproven, because we have no alien DNA to measure our human DNA against. But just for the sake of tales told throughout time, these cave images are certainly compelling. In creation tales, these Wandjina beings are said to come from the Milky Way. Boxy looking figures in Sego canyon are thought by some to be spirit beings of ancient shamans, yet some Ute Native Americans say they are actually Star People and not shamanic visitors. Of course some of the more well known Star People rock art involves carvings, such as Olmec heads believed to be wearing space helmets. And one of the more colossal images is of the astronaut-looking figure in the Nazca lines of Peru. Neither of these views can be corroborated, since the people who once lived there are now dispersed. In the end, a person could argue that the myths and tales of indigenous people do not fall into the category of science fiction, which according to the Wesleyan Anthology of Science Fiction suggests that the first science fiction story was Mary Shelley’s Frankenstein, published in 1818. Yet undeniably many of the elements popular in modern science fiction, such as wormholes, star travel, and aliens, do appear in these tales, and from these myths a lot of our modern themes spring forth. As an addendum, I would like to give a word of caution, if you are looking at the Thunderbird’s Path, as the Milky Way is called by the Anishnaabeg, it is advisable to maintain that it is merely comprised of flaming gaseous stars and star dust and not actual thunder spirit beings. I admit to looking longingly at the Milky Way that night of galactic cold, and before I could finish this piece of writing, lightning struck my Wi-Fi tower. It also wiped out my essay, my sources, and my notes, all of which had to be reconstructed while waiting for Wi-Fi service to reconnect so I could actually submit this text. I should have listened to my grandfather and stuck with the Pleiades only! It is wise to be wise, so I placed my tobacco on the blanket of snow and I am still averting my eyes, clasping my meteorite medallion, and dancing back and forth across the shifting snows of the sacred and mundane. Astronomy Across Cultures, The History of Non-Western Astronomy, edited by Helaine Selin. Springer, 2000. “Cree Legend of the Star People,” Wilfred Buck: bit.ly/1NEFAZo. The Woman in the Shaman’s Body, Barbara Tedlock Ph.D. Bantam Press, 2005. “In the Land of the Horned Gods: Shamanistic Motifs in Rock art of Utah,” Dennis Slifer Shaman’s Drum vol. 61. “The Legend of Abai Geser,” online epic poem of the Buryat Mongols: bit.ly/1ThMKzg. Chosen by the Spirits: Following Your Shamanic Calling, Sarangerel. Destiny Books, 2001. The Wesleyan Anthology of Science Fiction,edited by Arthur B. Evans, Istvan Csicsery-Ronay Jr., Joan Gordon, Carol McGuirk, Veronica Hollinger, and Rob Latham. Wesleyan, 2010. Northern Tales: Traditional Stories of Eskimo and Indian Peoples, selected and edited by Howard Norman. University of Nebraska Press, 2008. 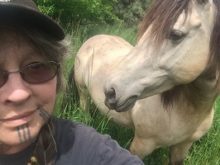 Of Métis (Cree) and Nordic descent, Misha Nogha writes, works, and lives on her small farm in northeastern Oregon where she raises a few Angus cattle and rides her Mustang horse.